Many people are learning from direct experience that a high protein and fat diet reaps many health benefits. Now, a global study has been published in the Lancet, and presented to the European Cardiology Conference in Barcelona indicating in a nut shell that world wide, with an increased consumption of carbohydrates ~ especially the refined processed variety ~ coupled with lower intakes of total fats, including (and I believe especially) saturated fats, mortality risks increase, not decrease like we have been led to believe for decades now. Results from a recently released, long awaited dietary study will put supporters of low-fat diets into a carbohydrate-fueled tailspin. According to the large cohort Prospective Urban Rural Epidemiology PURE study, higher fat diets that include both saturated and unsaturated fats are associated with a lower risk of mortality. And replacing said fats with high carbohydrate intakes (above 60% energy) is associated with higher risk mortality. The study observed people aged 35-70 from 18 countries across Europe, Asia, Africa, the Middle East, and the Americas to determine links between diet and cardiovascular disease and death. Researchers conducted follow-up visits every three years, and analyzed disease and death rates, from cardiovascular and non-cardiovascular related events, such as strokes and heart attacks. Globally, the average diet consisted of 61.2% carbohydrates, 23.5% fat (including 8% saturated fats, 8.1% monounsaturated fats, and 5.3% polyunsaturated fats), and 15.2% protein. However, this balance varied by region: on average, carbohydrate intake was highest in China (67%), South Asia (65.4%) and Africa (63.3%); total fat intake was highest in North America and Europe (30.5%), Middle East (30.3%), and Southeast Asia (29.2%). 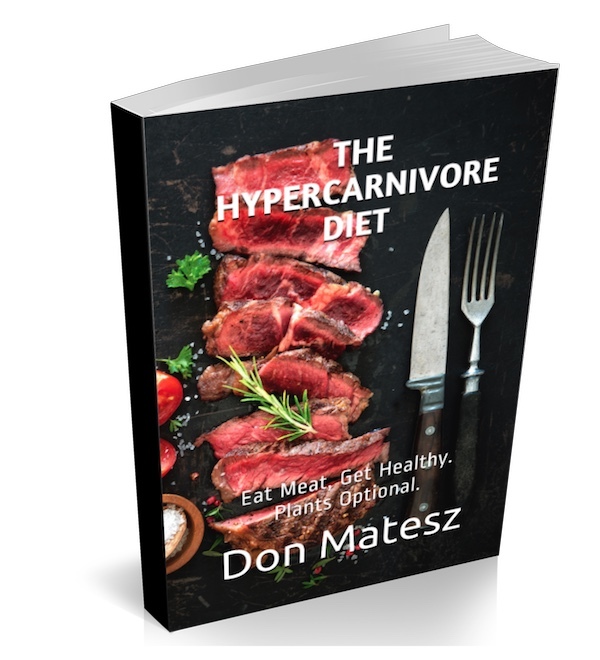 High carbohydrate diets were common, with more than half of the people in the study eating a high carbohydrate diet (at least 60% of energy from carbohydrates), and about a quarter deriving 70% of their daily calories from carbohydrates. Half of the people involved derived less than 7% of their energy from saturated fats, and three-quarters (75%) ate less than 10% from saturated fats. Putting this together, I believe it is safe to surmise: FAT, ESPECIALLY SATURATED FAT, IS NOT THE HEALTH VILLAIN WE'VE BEEN MADE TO BELIEVE. Decades ago, when people regularly consumed saturated fats from animals and for cooking, and more red meats and locally raised animal foods including eggs, there did not exist the level of obesity, diabetes, heart disease, and the myriad of health problems we now see today ~ sadly, world wide. 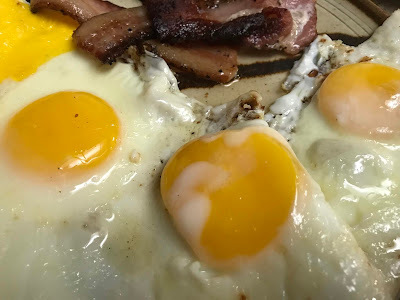 Even the article, Good Eggs: For Nutrition, They're Hard To Beat on WebMD sings the virtues of eggs, although there are a few points on the article that are not quite accurate. Such as when they write, "When scientists learned that high blood cholesterol was associated with heart disease...", they write it as if it was affirmatively proven, and it wasn't. 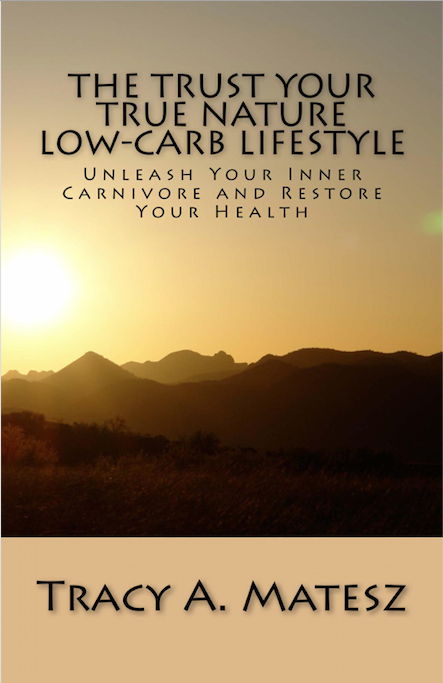 For more information, you may also be interested in The Great Cholesterol Myth, by Johnny Bowden. I linked to his and a few other books on this topic below. Now, lets get back to those eggs! 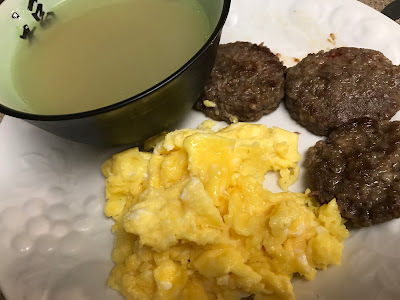 We often have eggs for breakfast ~ whether with bacon, sausage, leftover steak, or burgers ~ as they really can't be beat. For a while, we were blending them into an eggnog to drink raw. For this past month, we were experimenting with reducing dairy intake. Currently, we still are consuming butter, and our weekly latte at Echo Coffee House, made using half-and-half. Being that it's getting hot, it may be time to resume our raw eggnog drinks. We vary how we do our meals. 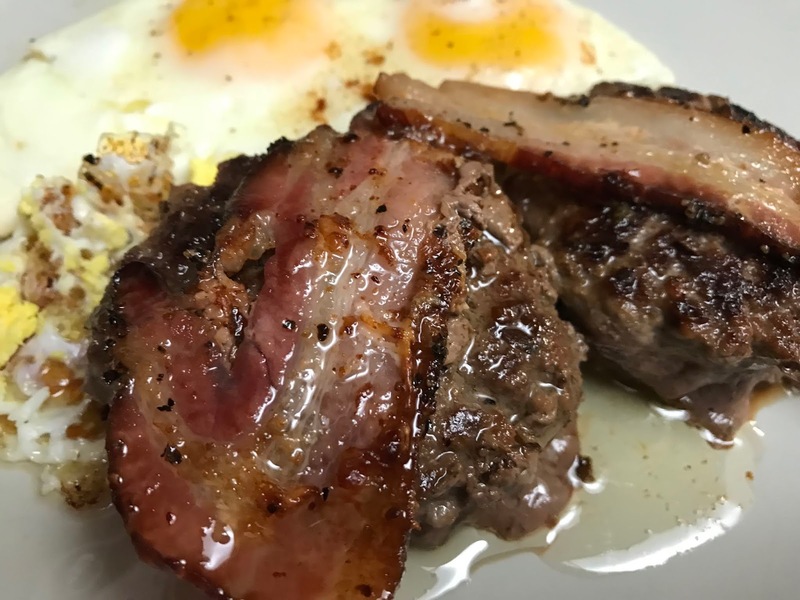 Sometimes we keep it simple, with just bacon or sausage and eggs for breakfast, and eat a heartier second meal. 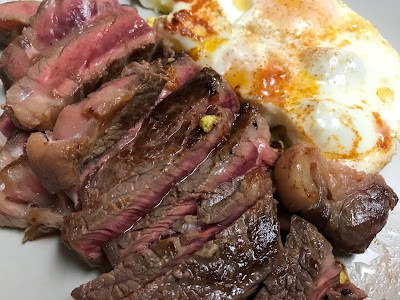 Otherwise, we go big, and have the eggs with some form of animal protein, like the burgers and steak shown, or with chicken breast, below. Even fish is great with eggs for breakfast! 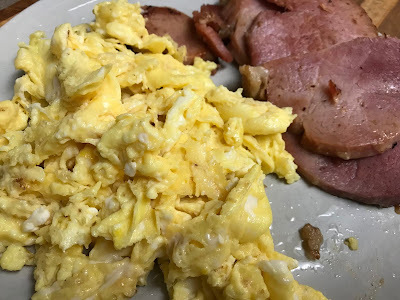 Basic Fried Eggs & Bacon ~ one cracked, so it's a little more cooked in the top left corner. Ultra creamy scrambled eggs cooked in a Vitamin A-rich butter (Kerrygold.) This was actually a recent dinner. Eggs, an excellent new sausage that recently appeared at our local Sprouts, and some bone broth. It was just perfect. These are Trader Joe's Brats which were very juicy and flavorful w/ a great texture. Weekend brunch. 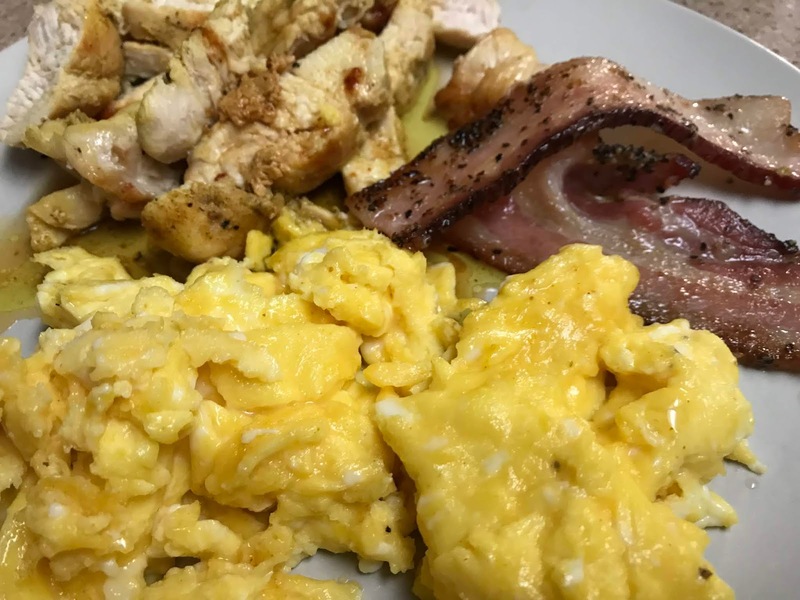 Creamy, Buttery Scrambled Eggs, Bacon & Fried Curry Chicken Breasts. This hearty breakfast, consumed post training, held us over for HOURS! We ate this at 9:00AM. We were busy the entire morning at our clinic, so we were not home to eat our second meal until 4:00! I NEVER EVER EVER could go that long between meals when eating a carbohydrate-rich, low-fat plant-based diet!!! When eating leaner meats, as we have a couple times recently, I've been cooking them in a good helping of ghee. 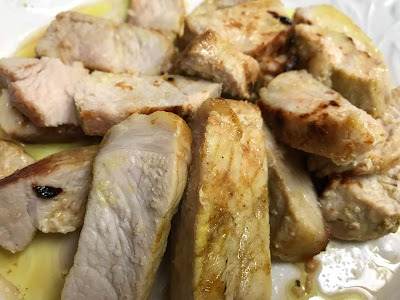 Center cut pork chops and skinless chicken breast are both quite lean, and come out good prepared this way. Since the leaner cuts can easily dry out if over cooked, it helps to marinate them first in an acid. We have been gifted with locally grown white grapefruits recently, so when life hands you grapefruits, you make marinade. Seasoning with salt, pepper, and a little curry powder gave both the pork and the chicken a great flavor. I really enjoy the taste and aroma of the curry powder on the meat cooked in ghee. Something about the sweet buttery goodness of ghee blended with curry seems a match made in ground beef stuffed in bell pepper, or Hungarian Cabbage Rolls heaven. One of the times I cooked the chicken, I prepared it almost like deep frying, only not. You are wondering what the heck does that mean? Well, it wasn't made in an oil (which is less stable, and not very healthy), and it was not breaded, nor completely immersed in the fat. 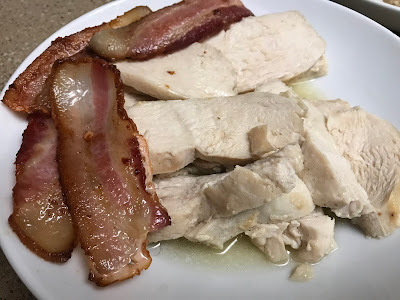 I don't even try to make keto/carnivore substitutes for things like breaded chicken as I just don't feel drawn to do so. I prefer simple. It was fun to do the almost fried chicken approach (sort of like Almost Famous?) 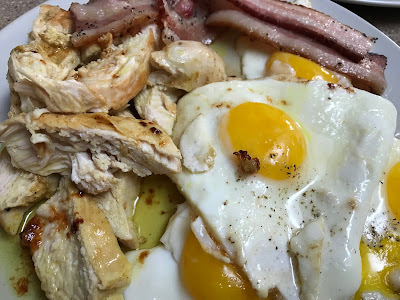 which was enough to make the lean chicken more palatable, and a better ratio of protein to fat. When preparing a chicken breast for breakfast, which I did just this morning (shown in the picture above.) I cut the breast into half the width so it would cook more evenly and more quickly. Seasoning same: salt, pepper, curry. 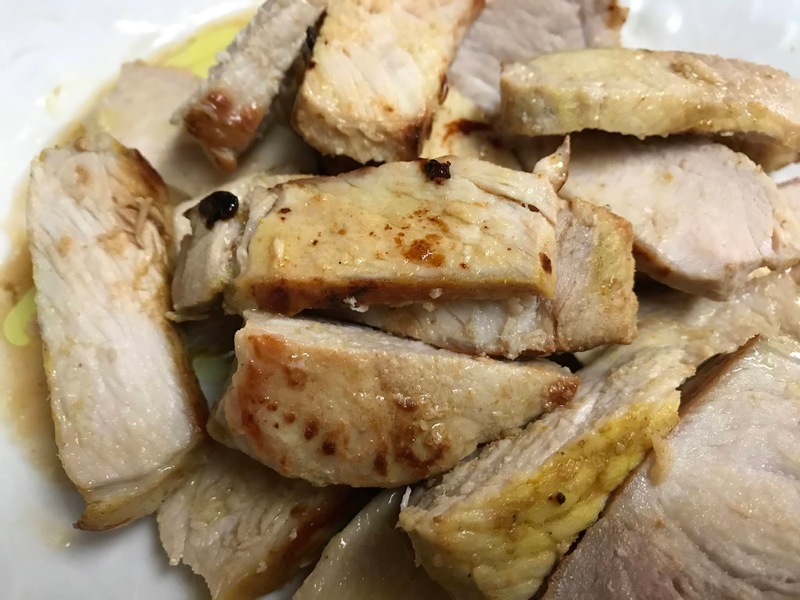 Both the pork and the chicken breast taste great cooked in ghee, but you could use coconut oil blended with butter or ghee as well. The butter itself has a lower smoke point than the ghee, which is why ghee is a better choice. I don't recommend using oils. A good quality, non-hydrogenated pork lard from a good source would be another alternative, along with other animal fats. Duck fat is supposed to be good, but I've not tried it yet. to fill ~ 1/4 - 1/2 inch up the base of the pan. Just season as desired, and place chicken in once the fat is hot. and this meal (which we had two mornings in a row) really had some staying power! DON'T FORGET TO POUR THAT LUCIOUS, CURRY INFUSED GHEE ON TOP BEFORE EATING!!! Of course, you can prepare any cut of chicken this way, but chicken thighs with skin on our fattier than skinless chicken breasts. You may not need all that buttery-rich, curry-infused ghee poured on top. It's helpful to add that fat when eating the leaner cuts. Trust me! By the way, chicken breast is an excellent source of potassium as well! Women at our clinic think I'm insane when I tell them what I eat. They ~ like most of us ~ think they will get fat eating all that fat. People just don't realize that our body is made up of a lot of fat. Fat is the preferred fuel! It burns WAY CLEANER than glucose for long-lasting, focused energy, and balanced blood sugar. 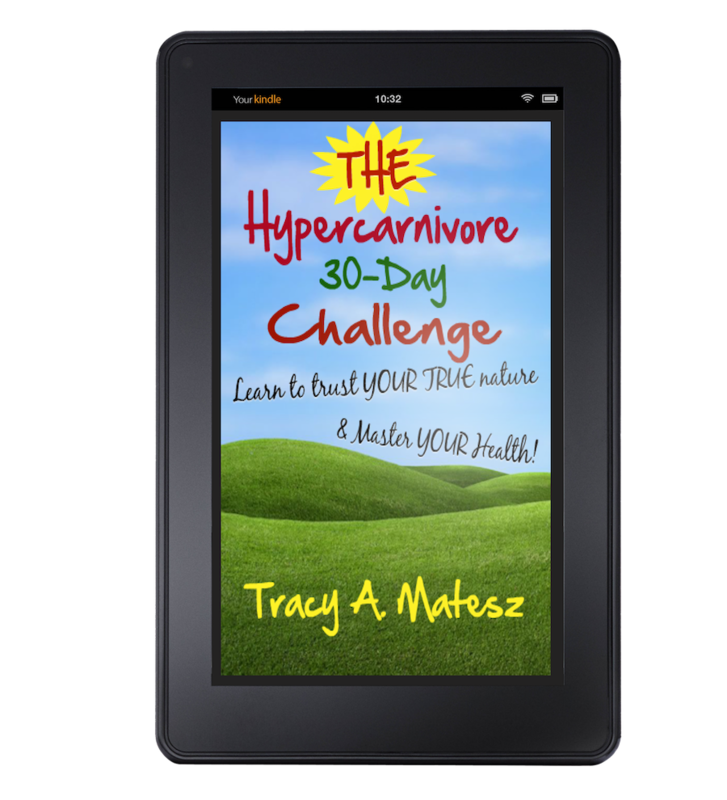 With my history of hypoglycemia, and being pre-diabetic ~ having many occasions where I would 'drop' and have a mini seizure like experience while eating that 'healthy' whole foods, plant-based diet ~ I HAVE A LOT OF EXPERIENCE WITH THIS! I have more lean muscle, and a smaller waist than I ever achieved eating a high carbohydrate, low-fat, plant-based diet!!!!! Chicken thighs cooked in ample fat with a hint of curry, similar to the chicken breasts. Lean, center cut pork chops were marinated first with grapefruit juice (use lemon, lime, or even cider vinegar). with a little added ghee. If you are careful not to over cook, they come out tender and juicy. double-thick peppered bacon! Serious staying power! depending upon where we live, and our ability to get more locally sourced meats, including fish. I happen to miss and love trout and mild white fish, abundant in the Midwest. I highly recommend reading about this topic as most of us could end up with a doctor attempting to prescribe statins to us at some point. We all have been so brainwashed that meat and saturated fat is bad, that we have to keep feeding our mind with the facts. Otherwise, my food photos won't be so enticing, and you'll be thinking "that can't be good for me" while looking at them! (So, yes, a bit of a selfish motive.) But all kidding aside, I really want to see people improve their health, and I know the biggest battle is with our minds. As the saying goes, "A like can travel half way around the world before the TRUTH even gets off the ground" ~ or something like that. Every opportunity I have to share some books or other resources, to keep exposing the lies that have been perpetuated through the last several decades, I will. We all need to keep reminding ourselves that this is how we our great grandparents used to eat, and they lived long healthy lives. Eat meat and saturated fat. It's good for us! It's good for our skin, our brains, our athletic performance, our nerves ~ our happiness and overall health!